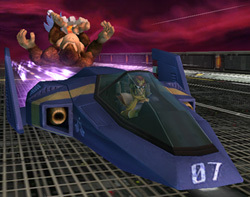 The most famous F-Zero pilot that fans know and love makes a comeback in Project M, once again as the tough and speedy challenger he was in Melee, while still having received several buffs. 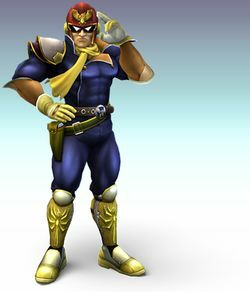 After his Brawl iteration was heavily criticized due to a loss of some of the amazing speed and power he had from Melee, in addition to the general physics of the former itself, Falcon was reverted back to his unanimously better iteration from Melee, with a minority of his buffs from Brawl maintained, and the reintroduction of the Melee physics only make it better for him. Falcon is arguably one of the most versatile fighters in the game; as mentioned, he utilizes a combination of impressive speed and power. Falcon Combo Two punches a knee and more fast punches. + + + + Roundhouse Kick Falcon does a roundhouse kick on the opponent. + + + + Falcon Axe does an axe kick. + + + + Low Sweep Falcon kicks while crouching. while dashing while dashing while dashing while dashing Falcon Lunge Rams himself into the opponent. Smash + + + (Smash + ) or (Smash + ) or Elbow Smash He smashes his elbow into the opponent. Smash + + + (Smash + ) or (Smash + ) or Double Kick He kicks upward twice. Smash + + + (Smash + ) or (Smash + ) or Falcon Sweep He kicks in front of him then behind him. after grab after grab after grab after grab Light Knee Falcon knees the opponent. after grab after grab after grab after grab Forward Punch Punches the opponent forwards. after grab after grab after grab after grab Back Kick Kicks his opponents backwards. after grab after grab after grab after grab High Punch Punches his opponents upwards. after grab after grab after grab after grab Ground Shove Falcon shoves them on to the ground. Kicks of Retribution Falcon kicks two times. + + + + Knee Smash Falcon knees his opponent. If this attack hits at the very beginning in the right spot it is a powerful electrical blast that sends opponents far. Otherwise it's just a weak tap. If the taunt button is hit on impact with the sweetspot, Falcon will yell, "Yes!" just like he does during the Falcon Dive. + + + + Falcon Backhand Falcon backhands his opponent. + + + + Falcon Flip Falcon does a flip kick. + + + + Falcon Stomp Falcon thrusts his legs downwards. This attack can meteor smash. If the move connects with his torso, it will spike and deal fire damage. The main drawback of this attack is that it takes a bit of time to execute, so Falcon can easily be struck before his signature punch is unleashed. But when you can find the time to hit with this, it's easily his most potent attack. If you tilt the Control Stick backwards while this move charges, he'll turn around and perform it in that direction instead. Doing this makes it slightly more powerful, but also takes slightly more time to charge. It can be reversed up to 4 times, with it gaining a 1% increase every time. First he is just charging at the opponent. At the encounter, his fist becomes coated with fire, then...POW! This will launch the opponent up if used on the ground, or launch down if used in the air. Since Falcon charges straight forward in the air, this can be used as a recovery move. But when Raptor Boost is used in the air, Falcon will be completely helpless until he lands, even if it hits. This is Falcon's main recovery move; He'll leap into the air and attempt to grab an opponent and deal fire damage to him/her. This is notable for being an aerial grab attack, which can be surprisingly useful to capture shield-users on different platforms. Capt. Falcon launches forward with his foot cloaked with flames, attacking any one or anything in his path. This travels forward when used on the ground, but at a downward angle if used in the air. He salutes and says, "Show me ya' moves!" + ( or )+ or or He holds out one hand in a beckoning gesture and says, "Come on!" + He charges up with a fiery aura, while muttering a soft, "Yes!" Blue Falcon: summons his Blue Falcon in front of him to hit any number of opponents. then teleports his victim to an unknown track and rams them with his car, the Blue Falcon. The attack causes very high knockback, often a one-hit KO if the opponent has a medium damage level. However, this only works if he hits someone when summoning his car. He is the only character with a cinematic final smash. Strangely, it will delete all items on screen. This page was last edited on 21 July 2017, at 19:14. This page has been accessed 1,460 times.